Artists Comments: One of the most notable features of the City of Refuge is the abundance of palm trees scattered throughout the park. 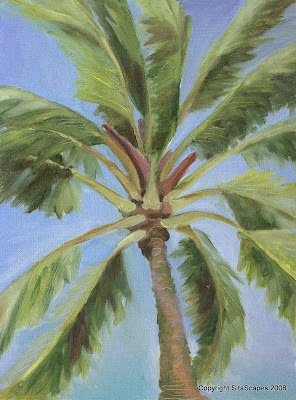 I was inspired by the skyward trees and decided to try and paint one such palm tree as I gazed up from under its shade. My challenge was to infuse my greens with other colors to avoid monotone palm frons.